There are several reasons why a horse wants to take a space, enter a space or preserve a space. These underlying reasons aren’t necessarily a statement of dominance or subordinance. Horses may want to groom another horse or may feel sick or in pain and choose not to connect… There are many possibilities. Although every horse can take or preserve space, the way they do so gives us a clue about their position within a specific herd of horses where each horse has their own expression and power. That is why it is interesting to take a look at the combination of horses who are interacting. The way a horse takes or preserves space tells us something about their own individual approach within an interaction. 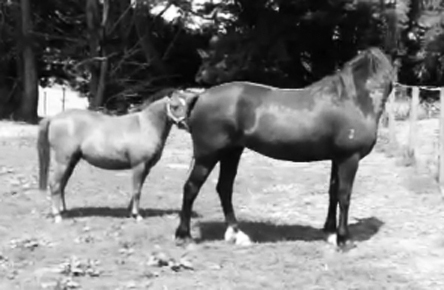 The way horses respond within a horse to horse interaction also gives us clues on how to interact with this specific horse within a horse-human interaction. We can notice for instance that Ruby is very persistent, but not aggressive, she responds to strong signals but does not easily give up. She asks for a clearer, determined language that is very consistent but never harsh! When we are able to see when a horse expresses a tension within his or her facial expression, it gives us the opportunity to make changes so a certain problem, the cause of tension can be dealt with, solved or removed. It is an important key to make sure your horse is in good health and in a harmonic state. The cause of tension is always pressure, the horse feels uncomfortable. The cause of tension can be traced back to physical stress, but also emotional or mental stress or the combination of these can be the cause. This is why it is good to feel and see whether you can see a difference within the expression of a horse in different circumstances. Another possibility is to trace back where the energy is directed too, the inner focus of the horse always lies on the cause, for this you would need to use your intuition. An open and relaxed expression with bright eyes is what we are ultimately looking for, when your horse expresses this harmonious state you can be sure that he or she feels good.